Lieutenant General Samuel Ebbesen is a retired three-star United States Army general. Ebbesen was born in Saint Croix, U.S. Virgin Islands but the date of his birth is unknown as are the facts of his early life. He eventually moved to the mainland United States, settled in New York City, New York, as a young adult, and entered the City College of New York (CCNY) in 1957 and obtained a Bachelor of Science degree in Political Science from that institution in 1961. While at CCNY he enrolled in the ROTC program and received his military commission as a Second Lieutenant upon graduation in 1961. Ebbesen would later earn a Master’s degree in Public Administration from Auburn University in Alabama. During his military career, Ebbesen has been stationed throughout the United States. He also served in South Vietnam during the Vietnam War beginning in 1966 as a military adviser and after a brief return to the United States, assuming his last assignment there as a District Senior Adviser to the U.S. Army’s XXIV Corps in 1970. In September of 1982, Ebbesen was promoted to Colonel and from 1983 to 1985, Ebbesen was the Commander of the 1st Brigade, 101st Airborne Division (Air Assault) at Fort Campbell, Kentucky and from 1986 to 1988 he was Chief of Staff for I Corps at Fort Lewis in Washington State. 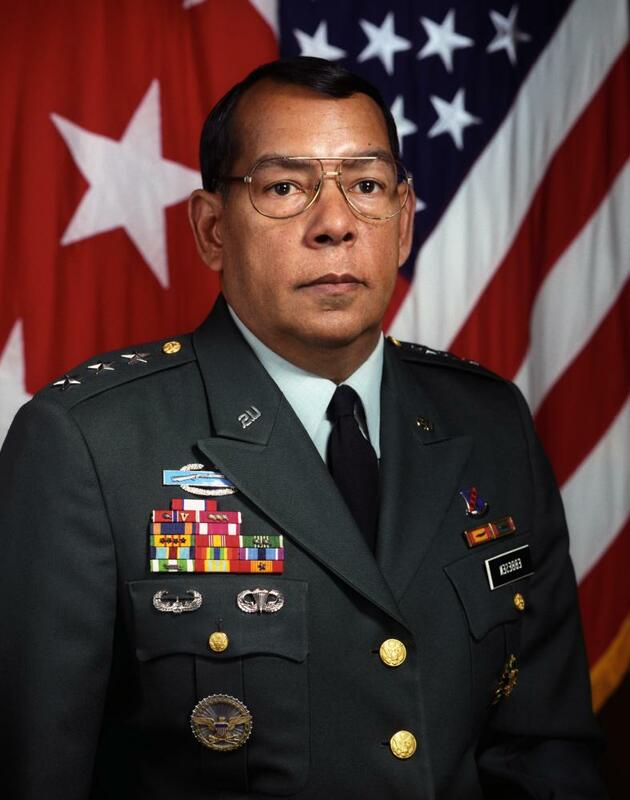 After a brief stint at the Pentagon where he was Deputy Chief of Legislative Liaison for the U.S. Army, and at Fort Wainwright, Alaska where he was Assistant District Commander for the 6th Infantry Division, Ebbesen served as the Commanding General of the Second U.S. Army at Ft. Gillem in Georgia, from April 1990 to July 1992. Ebbesen was promoted to Brigadier General on January 1, 1988. Ebbesen was promoted to the rank of Lieutenant General in March of 1993. One year later, in 1994, he received his last military assignment when he became the Deputy Assistant Secretary of Defense for Military Personnel Policy and was stationed at the Pentagon in Washington, D.C. His task in that assignment was to help plan and organize deployments of military personnel throughout the world. Ebbesen finally retired from military service in January of 1997 at the rank of Lieutenant General after serving in the U.S. Army for over 35 years. He was highly decorated for his service, receiving over his career the Legion of Merit and the Bronze Star Medal among other commendations. Since his retirement, Ebbesen has been actively involved in multiple business ventures, beginning in 2003 with his assumption of the role of Senior Vice President of the New Innovative Communication Corporation, when he was responsible for all telecommunications in the Virgin Islands which allowed him to return to his place of birth. He also became involved in involved with numerous charity causes, including the Boy Scouts and the American Red Cross. Ebbesen has also been involved in supporting healthier nutrition in schools and specifically lobbied for the 2010 Child Nutrition Act. Ebbesen continues to work and reside in the Virgin Islands. Samuel E. Ebbesen, “General: School lunches are U.S. national-security issue,” Reuters, April 15, 2015, http://blogs.reuters.com/great-debate/2015/04/14/u-s-general-school-lunches-are-a-national-security-issue/; “Executive Profile: Samuel Ebbesen,” Bloomberg, https://www.bloomberg.com/research/stocks/private/person.asp?personId=8185225&privcapId=961835; Walter L. Hawkins, Black American Military Leaders: A Biographical Dictionary(Jefferson, North Carolina: McFarland and Company, 2007).